Brinckerhoff Cemetery, Queens, March 10, 1927. Borough President Queens Collection, NYC Municipal Archives. 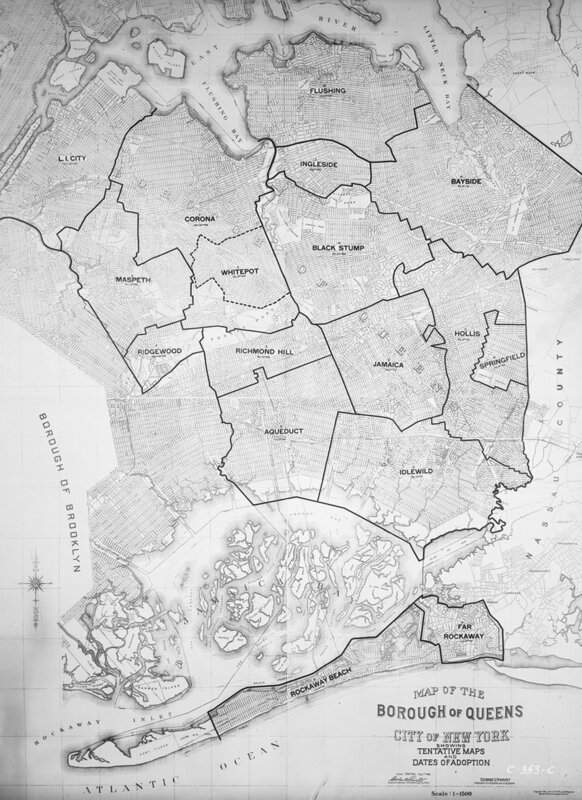 Map of Queens, 1924. Borough President Queens Collection, NYC Municipal Archives. I continued to come across many other photographs of colonial-era graves. The captions—written directly on the negatives by the photographers—gave the names of cemeteries I’d never heard of. It was interesting that they bothered to photograph individual headstones and not just the broader views of the land. 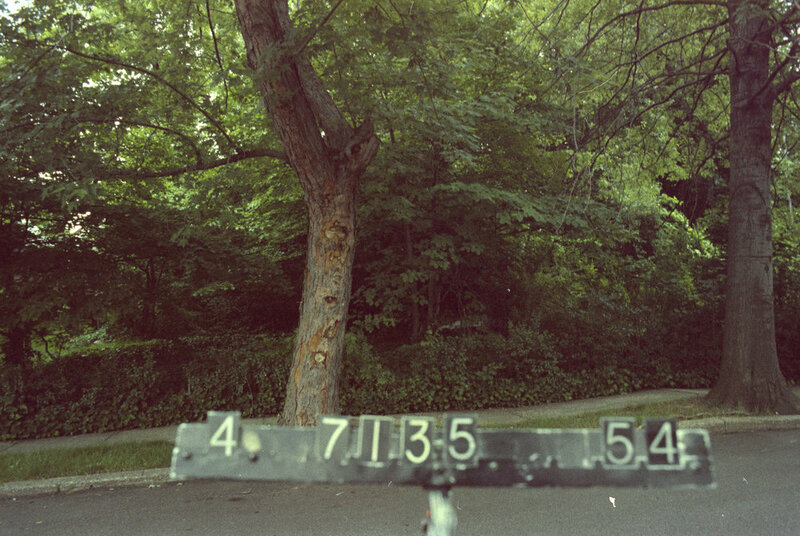 Photographers and archivists can’t help being curious. We like to dig, we like to find things, and more importantly we like to know that someone, somewhere, remembers the past and the people who lived it. Who were these people whose graves were photographed? That question led me down the proverbial rabbit hole. Beginning in 1919 an engineer named Charles U. Powell conducted a survey of the private cemeteries of his native Queens. A descendant of several colonial Queens families, Powell submitted his report in 1931 to Borough President George Harvey, saying that he had undertaken the project because “a permanent detailed record of each private cemetery would be of historical and genealogical, and even legal, interest to posterity,” as many private cemeteries had already been “completely erased from the topography of the Borough.” His report is detailed and thorough, with maps and diagrams of the graves that were still visible at the time. It documents some twenty-three burial grounds, including one Native American and two African-American cemeteries. (The African American Cemeteries will be the subject of a future post.) The image of housewife Aeltje’s grave is one of only two such photographs in the report. Brinckerhoff Cemetery, Queens, ca. 1985. Department of Finance Collection, NYC Municipal Archives. Aeltje was baptized Aeltje Janse van Kouwenhoven on April 28, 1678 in Brooklyn. Her parents were Jan Gerritse van Kouwenhoven and Gerardina de Sille. Aeltje was a descendant of Wolfert Gerritsz van Kouwenhoven, one of the first Dutch settlers in Brooklyn. The Brinckerhoffs were also an old Brooklyn Dutch family, having first come to New Netherland in 1638. After the English took over, the family moved to Newtown in Queens, where Dirck was born in 1677 and where his father, Abraham, served as the town magistrate. The family acquired land at Black Stump in 1698, and portions of this were given to Dirck and Aeltje in 1705 and 1710. The Brinckerhoff Cemetery was located mostly on Dirck and Aeltje’s farm, with a portion stretching onto a neighbor’s land. Deceased members of the neighboring families were also buried there, especially as, over the years, marriages interconnected families. A few years after Aeltje died, Dirck remarried. Dirck and his new wife Elizabeth sold the farm in 1747, and Dirck passed away the following year. The farm and its cemetery subsequently passed through a succession of owners. has a special character and a special historical and aesthetic interest and value as part of the development, heritage, and cultural characteristics of New York City…and that despite virtually a century of neglect, and the fact that today there are no visible above-ground gravestones…the Brinckerhoff Cemetery survives as a rare, and one of the oldest, colonial-era burial grounds in the Borough of Queens, as well as one of the few tangible links to the early-18th century, and rural, history of the borough. Other cemeteries, unfortunately, didn’t fare so well. Powell and the Borough President’s photographers also documented the grave of Sarah Rapleje, the wife of George Brinckerhoff. Sarah died in March 1787 at age thirty-two. 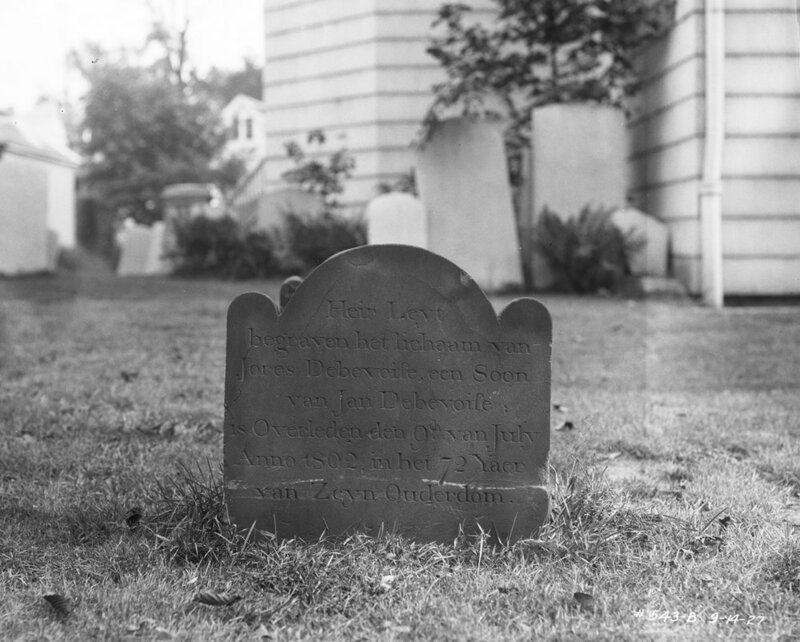 The gravestone next to Sarah’s English-language stone was too damaged to be read, but Powell was able to read the words huis Vrow on the stone in 1919, making it the grave of a married woman. The cemetery, known as Rapelje Cemetery, where Sarah, George, and the unknown woman were laid to rest stood at the present-day corner of 21st Street and 21st Avenue in Astoria. A three-story brick apartment building was built on the site of Rapelje Cemetery in 1949. Rapalje Cemetery, Astoria, Queens, October 26, 1927. Borough President Queens Collection, NYC Municipal Archives. A mixture of the Dutch and English languages on the gravestones gives us an idea of the mixed identity of the area in colonial times. Still standing is the Dutch Reformed Church of Newtown, a beautiful wood-frame church established in 1732, sixty-eight years after the Dutch town of Middenburgh became the English town of Newtown. Though largely destroyed in the Revolutionary War, the church was rebuilt on the original cornerstone after the war, and a new bell was cast for it in the Netherlands in 1792. Preaching in Dutch continued at the church until 1834. 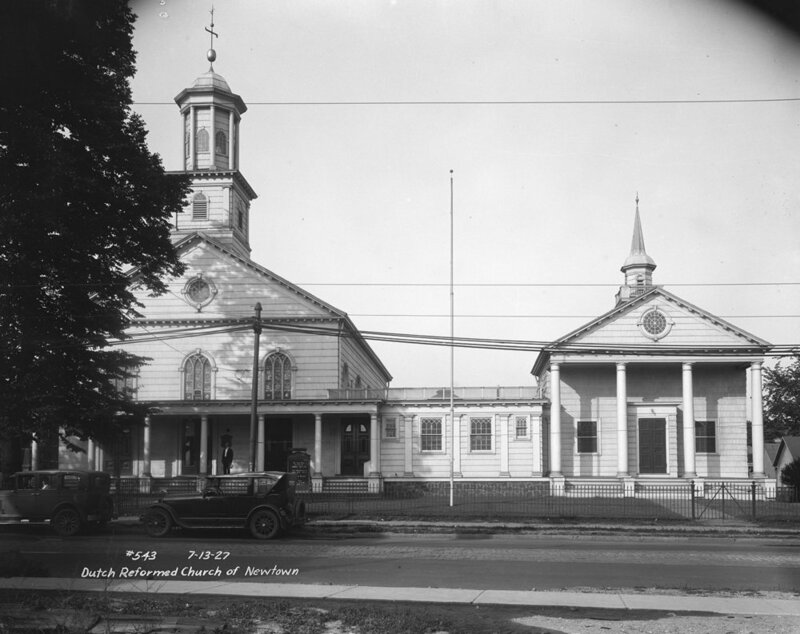 Dutch Reformed Church of Newtown, Queens, July 13, 1927. Borough President Queens Collection, NYC Municipal Archives. Churchyard of Dutch Reformed Church of Newtown, Queens, September 14, 1927. Borough President Queens Collection, NYC Municipal Archives. In the church’s graveyard, the headstone of Jores Debevoise caught the eye of a photographer. It’s a very interesting stone for several reasons. First, it’s inscribed in Dutch and was placed in 1802, further illustrating the persistence of Dutch identity. Second, it exhibits some of the linguistic evolution mentioned at the beginning of this post (“body” is lichaam here instead of the older lighaam), while showing that Dutch was still not quite in modern form (the word for “his” in modern Dutch is zijn, while on the grave it’s zeyn). Finally, Debevoise is a French surname. Most likely the family were Huguenots, or French Protestants. Many Huguenots emigrated from France to the Palatinate or the Netherlands during the Reformation, and many also came to colonize the New World. Here, as in the Netherlands, they often mixed with Dutch populations and came to identify as more or less Dutch. First pages of William Leverich’s notes. Newtown Records, NYC Municipal Archives. Old Presbyterian Church Gravestone “Phillip Duvineer ages about 81 years” (Died 1745 leaving 200 pounds and interest to the Presbiterian (sic) Society, according to stone), September 14, 1927. Borough President Queens Collection, NYC Municipal Archives. The colonies were often populated by persecuted religious sects. 1662, the English colonists in Newtown elected William Leverich, a dissenter from the Church of England, as their minister. The congregation he presided over would become the Presbyterian community of Queens. A handwritten volume of Rev. Leverich’s notes on scripture was kept as part of the town records of Newtown, and is now in the Municipal Archives. The grave of one Philip Duviveer testifies to this burgeoning community. Of course, burial in Queens didn’t start with European colonists. The area of present-day New York has been inhabited since at least 10,000 years ago, after the land emerged from the last ice age. According to an archaeological study by the NYC Dept. of Design and Construction, the Queens area was home to small villages of the Rockaway, Maspeth, Matinecoc, and other native peoples, who lived primarily along the bays and streams. One of their main sources of food was shellfish, and this can be seen in the various shell middens—mounds of discarded oyster shells—over which a number of structures in Queens were built. Lawrence Homestead, Bayside Queens, built on the site of a shell midden, September 3, 1927. Borough President Queens Collection, NYC Municipal Archives. 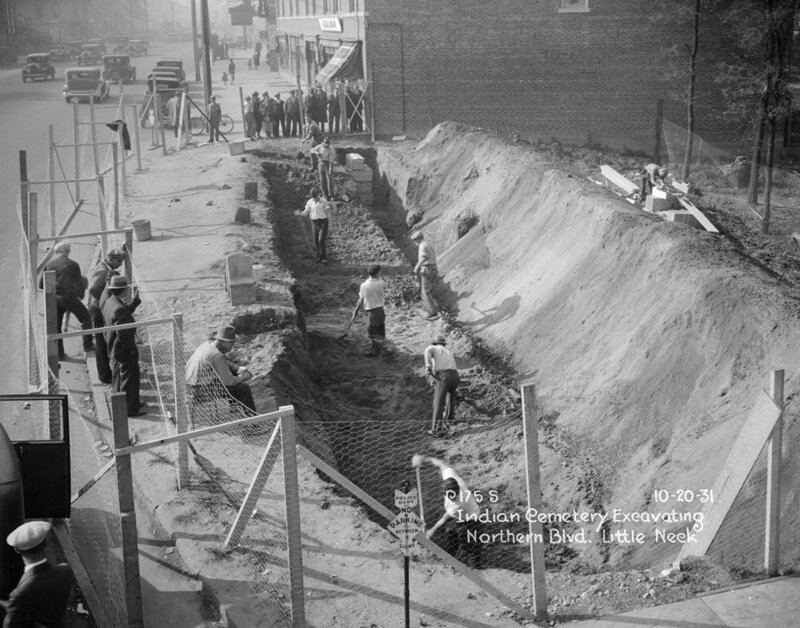 Excavating Indian Cemetery on Northern Boulevard, Little Neck, Queens, October 20, 1931. Borough President Queens Collection, NYC Municipal Archives. James E. Waters died in 1927 at age fifty-one, having served as chief of the last remaining Native American tribes on Long Island. He was buried in Zion Episcopal Church Cemetery with his family. Charles Underhill Powell passed away in 1956, twenty-five years after submitting his report. He was buried at Flushing Cemetery. Their work, though not entirely successful, helped preserve and record, as well as protect, the final resting places of many New Yorkers. Yet the struggle is ongoing, and has been taken up by others. Excavating Indian Cemetery on Northern Boulevard, Little Neck, Queens, October 20, 1931. The three people standing inside the fence are most likely tribal representatives. Borough President Queens Collection, NYC Municipal Archives.